If you think that "men are from Mars, and women are from Venus", then you probably haven't met Aoléon yet. 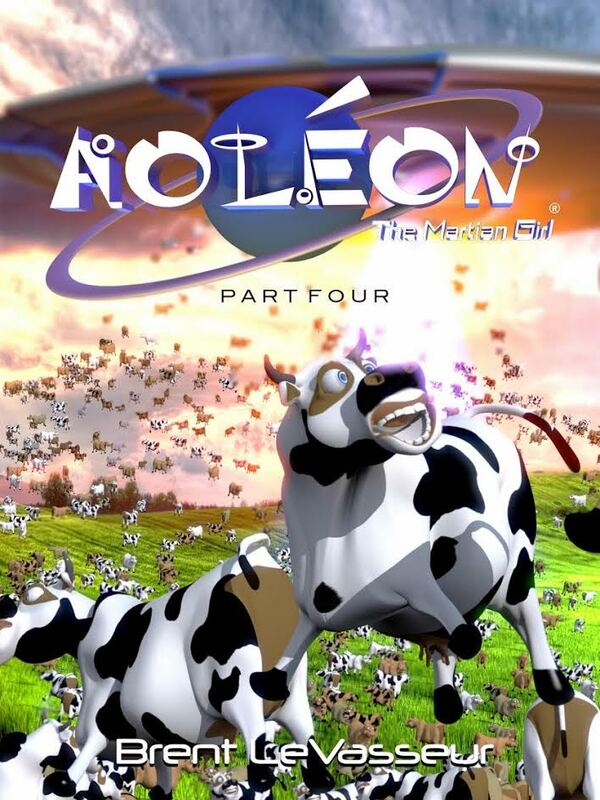 Aoléon, the Martian girl, is the female protagonist in this fun, five-part, sci-fi series. I've just read the ebook Aoléon: The Martian Girl (Part 4: Illegal Aliens), written and illustrated by Brent LeVasseur. Like the other parts of this book, Part Four is fast-paced and action-packed. In this story, Aoléon and Gilbert attempt to rescue Phobos and Deimos, Aoléon's parents, who've been captured and taken to a secret base. The duo must also try to stop the evil Luminon, who has just begun an invasion of Terra (Earth), in order to steal cows. 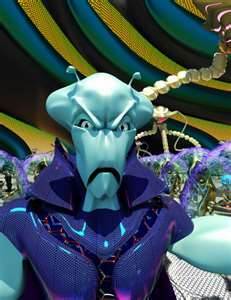 Throughout the story, Aoléon and Gilbert face many obstacles, including forces of nature, a dust storm, and even a giant slor, and Gilbert develops his psionic power, in this portion of the book. This is another fun, zany installment of the series, which I think will appeal to middle-grade girls and boys. The 3-D graphics are fabulous in each of these books. 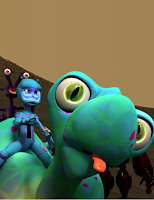 Aoléon is a charming, blue-eyed, blue-skinned Martian girl, and she and Gilbert have a solid friendship, with just a hint of romance in it. I love the cover of Part Four! I have a cow blog, La Vache Intéressante, so I am especially partial to cows. (I must also feature this cover on my cow blog.) I've enjoyed each "episode" of Aoléon: The Martian Girl, including this one, so far. I'm eager to read Part Five of this series, the last part of this book, to find out what's in store for Aoléon, the Martian Girl, and Gilbert, the Terran boy. Many thanks to Laura from iRead Book Tours for giving me a copy of this ebook. For more reviews, please stop by iRead's book blog tour for Aoléon: The Martian Girl (Part Four). Thank you for reading! Your comments are welcomed. Sounds like a fun read and the illustrations seem delightful as well. Thanks for sharing. This really sounds so cute. Among other things the pictures that you have posted from these books are very impressive. I really like these graphics. Fabulous is the right word. I can see how this imagery would be especially appealing to young people. Great to have an update on the happenings. Glad you've enjoyed the series so far! It does sound like a fun one! This series really looks like something my boys and I would enjoy. Great review!